Four IVECO STRALIS NP 460 LNG – the first LNG powered vehicles for Hungarian market– were delivered in January at a ceremony on the premises of IVECO Dealer DanubeTruck in Budapest, where Norbert Joichl, CEO of Eastern Europe, Duvenbeck Company Group, received the keys of the four vehicles from Zoltán Zákány, Managing Director, DanubeTruck Magyarország Kft. This delivery marks an important milestone event in the long haulage transport segment in Hungary, which comes at a time when the demand for greener services is growing worldwide and IVECO’s advanced natural gas technology provides the mature alternative to diesel and a sustainable solution for our planet and for business. Also attending the ceremony was a representative of global energy supplier Shell, a pioneer in LNG with the fastest developing LNG network in Europe as a result of its commitment to promote the use of natural gas as a transport fuel for trucks. “Innovation in motion; this is our slogan and it drives us to always strive for testing the latest and most attractive technologies. LNG technology is promising from the environmental point of view, but it is also an economical solution in the long run. We had been testing LNG trucks of different brands for two weeks and finally we have chosen IVECO Stralis, which gave us really good experiences,” said Norbert Joichl. 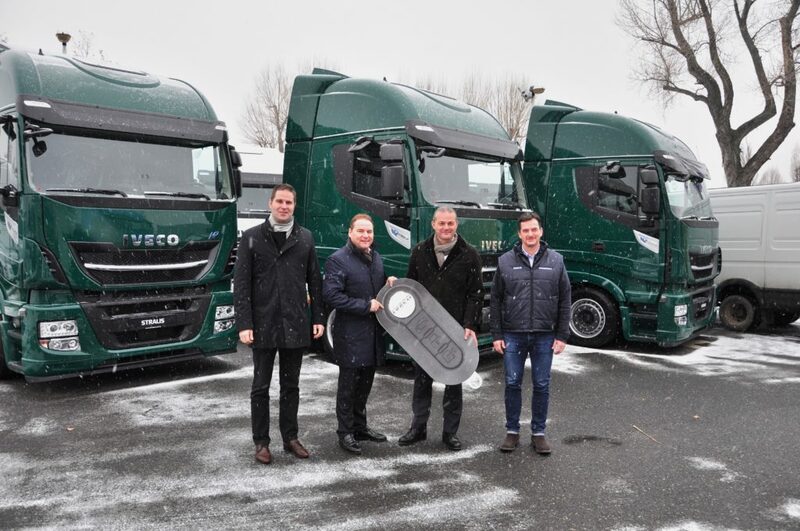 “It’s the first time that we put IVECO vehicles into operation in our Hungarian fleet of 140 trucks, and it’s also the first time for the whole Duvenbeck Group that we purchase LNG trucks. These four tractors will transport automotive parts between Austria and the Netherlands and Belgium, crossing Germany, carrying payloads of 12 to 18 tons. The LNG trucks are exempt from road tax in Germany for the next two years; this provides significant economic advantages in addition to the low fuel consumption. It means savings of about 20 cent per kilometer, which is approximately 20% of the total operating costs. When the first LNG filling stations open also in Hungary, we will also use our gas-powered trucks for missions starting and ending in Hungary,” explained Joichl. “We ordered the four STRALIS trucks with the largest LNG tanks available, with a capacity of 2 x 440 liters, so the range of the vehicles is around 1,100 kilometers. We specified these trucks with the most spacious high roof cab, comfort seats, parking air conditioner and driver assistant systems to provide a high level of comfort for our drivers. The quiet and smooth-running gas engines also contribute to comfortable working conditions. We plan to operate the new trucks for five years, and at the end of this period DanubeTruck Magyarország Kft. will buy them back. The IVECO authorized workshops throughout Europe are prepared for servicing gas-powered trucks, so there will be no problem,” added Joichl. “It is a great pleasure for us to welcome the pioneer and innovative vehicle purchasing decision of Duvenbeck Logisztikai Kft., which they made even before the important announcement of the toll exemption announcement for gas vehicles in Germany. IVECO has long seen natural gas as the mature solution for sustainable transport. IVECO Stralis NP LNG trucks are appearing in fast growing numbers in more and more fleets across Europe, and now this technology has started its development also in Hungary,” commented Zoltán Zákány.